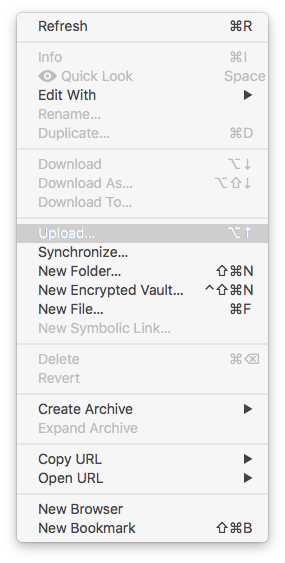 To upload a file or folder from your computer using Cyberduck you need to navigate to the desired location within your webspace, right click in the application window and select the Upload option. A new window will now open, here you can see all the files and folders on your computer. 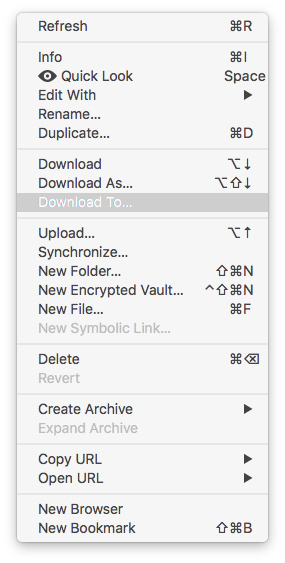 Navigate to the file you want to upload, left click to select it and then click the Upload button. To download a file or folder from your hosting, first make sure to have connected. Then navigate to the desired file or folder, right click its name and then click Download To.